As you may have heard, a vast army of elves is currently toiling 24/7 to bring you a brand-new Smooth Few Films website. In the process of doing this, the existing Leet World website may start misbehaving or looking funny, and there will definitely be an unknown period of time where both sites will be down while I have to do a bit of behind-the-scenes magic and make sure everything is in working order before we open it back up to the public. Hopefully the downtime won’t take too long. This is just a friendly note to let everyone know that you shouldn’t freak out if our site is down / broken / etc. today and tomorrow. We hope to have everything back to regularly scheduled programming on Monday (September 8th). NOTE: Kirk Cameron not included. This entry was posted in Maintenance and tagged Maintenance, redesign, smooth few films, the leet world, update, web design on September 6, 2008 by Jeff. Woot! My first time im first noobs! FIRST! 🙂 Whats with the picture?!!? 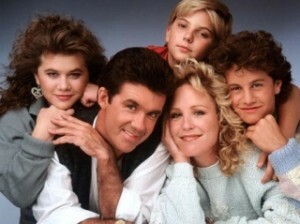 It’s from the show Growing Pains from a time of old called the 80s. It’s old and lame/awesome. EDIT: What’s that box on the elfs desk? I think I saw that show late at night here. Btw, the SFF web page is looking good. Smooth guys. [quote comment=”11528″]I think I saw that show late at night here. Haha you mean the landing page? That’s just a placeholder. We have way more in the works than just that. I love the sff font! You are talking about the PC there right? If so it’s a Shuttle..
Site maintenance period noted. Will refrain from cutting self if site access is impossible, for two (2) full days starting 12:00 am PST. yay my gravatar is working now! And there is only one elf, are the rest hiding from the camera? Oh and that pictar is from a while back if any one remembers. I wonder y u didnt take a new one. Edit: Oops sorry for double post, the first post didnt load so i posted it again. delete the first post if you want. Mostly I just looked for an image I could use for Humorous Effect. Nick hasn’t actually been working on the site today, just me (not pictured). I never noticed the “I” in films was a 1. Was it always like that? I thought Web Zeroes episode 01 was coming in the weekend? (Its 9:23p.m over here in NZ, on sunday). Oh well, I can wait…. will our old login on accounts still work on the new site?? Banana na. banana na na!! BANANA NA! BANANANA NA NA NA NAA!!! That should give you an idea of the color scheme of the new site. It’s pretty different from the orange and white you see here. Also, yes, your old log-ins will still work. Wow it’s gonna be hard getting to be used to the new website. If you guys are working 24/7, what are you doing for work? It’s a figure of speech. Also, there aren’t elves, in case you were wondering about that, too. Basically, he meant he was working night and day this weekend, since we have jobs during the week. I like the new website, but i still love the old TLW one way better. Prolly cause of the colors. So when are those shorts getting converted to ipod format? Could you have em done and release at the same time as web zeroes maybe? Smooth Few Films was founded in 2007 by Eddy Rivas, Nick Comardo and Daniel Miller. They were later joined by Jace Ford, Jeff James and many others. They are the creators of The Leet World, Web Zeroes, A Day in the Life of a Turret and much more.